Like many of you, I’m busy. I have a full-time career, a husband and a home to take care of, and I play daddy to two adorable dogs. I don’t know how I do it, but I do. Sometimes, though, I need a break — a little reward for staying semi-sane. Is there anything more soul soothing than filling up the tub with warm water and bubbles and soaking until all your cares melt away? To make the experience even more enjoyable, there are bathtub caddies that will prop up a book and hold a glass of wine for the ultimate in relaxation. The world has had a love affair with wine since about 4500 BC. That’s because just one glass has the power to calm your nerves and reduce your stress. This time of year, pour a healthy portion of red, curl up on the couch, and sip until your heart’s content. There’s not much time left to find a comfortable spot in the park before the weather takes a turn for the worse, so pull up your piece of green and drift off to dreamland while you can. “Good book” is relative. Right now I’m reading The Walking Dead: Compendium One, but maybe that’s not your thing. Take a trip to the library and browse the extensive selection for a title you never knew you wanted to read. Seeing new movies is one of my all-time favorite pastimes. AMC Theaters offers $6 movies every day before noon, so on weekends I often catch an early flick all by myself. The theater is never crowded, which means I won’t have anyone in front, in back, or on the sides of me talking and fidgeting the whole time. Turn off the stove and take a load off. Pick a menu from the pile and order from a place you’ve been dying to try. When you’re busy, any time you can connect with friends or family for more than five minutes outside of a holiday is a reward. Think of someone you enjoy talking to and schedule a 20-minute catch-up conversation. Retail therapy is another one of my favorite ways to reward myself. So I don’t go overboard and feel a sense of remorse instead of satisfaction, I set a limit on how much I can spend before I leave the house. It keeps my wallet in check, but I still get a little something I want. Exercise is more of a chore for me than a reward, but I know plenty of people who absolutely love going for a run. If you’re one of those people, lace up those sneaks, pop in your ear buds, and head out for a few laps. Watching all my favorite shows in one sitting is a total reward for me, usually reserved for a lazy Sunday afternoon. Nothing better than enjoying a reward with the fridge so close, right? If you’re both busy career people, cuddle time can be scarce. Whenever my husband and I have extra time, we’re right next to each other in bed, holding one another close. I bet there are lots of places in your neighborhood that you’ve been meaning to stop by. But one thing or another always happens that prevents you from getting there. Let today be the day that you finally stop in. What’s more rewarding than making a little extra money? Find something around the house that has value and post it for sale online. For large items, Craigslist is the best bet for a quick return. For small, more valuable items, let Amazon or eBay sell it for you. I love having the latest tracks on my iPod, but I can never find the time (or remember) to download the hottest new songs. As a reward, maybe I’ll take 20 minutes today to see who’s making waves on the music scene. Tie on that apron and mix up something decadent and delicious. Don’t worry about the calorie count, either — this is a reward. Whether it’s watching trashy TV or reading a gossip rag, kick up your feet and get lost in a world full of the ridiculous. Maybe you want your eyebrows waxed or perhaps those hands and feet need a little TLC. Give your favorite body specialist a call and schedule an appointment. Sometimes, to get through the workday, you need a little “you” time. Play Words with Friends on Facebook or another of your favorite games during your lunch break. Whenever I clean out my closet, there are so many things I don’t want anymore. But before I throw them out, I think to myself, how can I repurpose these? My biggest trick is turning unwanted pants into new shorts. If you have a good tailor (or you’re handy with a needle and thread), there are lots of ways to make something old new again. Pull out your box of crafts and paints and make something extraordinary that you can gift or hang on your own wall for you and your guests to admire. This is at the bottom of the list because I think it’s the ultimate reward. It’s extremely rare for me to even entertain the idea of taking a nap, so when the opportunity arises, I seize it. Naps are a great reward because you wake up refreshed and ready to go. Turn off the TV, shut the blinds, and let yourself get some rest. You deserve it! Have even more ways to reward yourself right now? Let me know in the comments below. I think this is a great idea, to have a list on hand of simple and frugal things to do that make you happy. I would say you should even hang it in the kitchen or somewhere so that you can be reminded to do these things on occasion. I know sometimes that I get so busy and wrapped up in work that if a half hour of free time suddenly comes upon me, sometimes I am at a loss for what to do. Sometimes you can forget how to relax! One thing that I really love to do is just take a walk. Not the crazed commute power walk, but one where I can go slowly and look at things. This is a great list of ideas! As an Audible subscriber, one of my rewards right now is to buy an audio book. It's something I can do to get a boost and reward my mind at the same time. Great list, and one that I'd like to add to: Download a free book to my Kindle. I love to read, but digital books can get expensive. Fortunately, there are plenty of free books, especially classics, you just have to take the time to find them on Amazon. I reward myself with a 20 minute search for a book or two I don't have and it costs me nothing. Since I'm only searching for free books, this also encourages me to try something different that I'd never pay for - broadening my literary horizons is a reward in itself! If you don't have a Kindle, downloading the Kindle reader app to your computer is also free. Check to see if you library has eBooks that you can download and borrow. Giving and getting a massage from your significant other is another way to frugally reward yourself. My daughters and I schedule a "Day of Health and Beauty" every few months. We pretend we are at a spa and make spa foods. We do a mountain hike in the morning, then yoga and aerobics later. Then we do a homemade facial, mani and pedi. If there is still time, we try new makeup techniques or the whirlpool tub. This is such a great idea! Not only does it sound incredibly relaxing, but it's also conducive to bonding and strengthening the relationship. Thanks so much for sharing! This is "frugal"? Seeing a movie, ordering take-out, buying "something small", getting a mani/pedi? Sorry, but none of those are within *my* budget. I don't own a DVR, nor even a TV set; same problem. I know it's not free if you don't have Internet access, but since you're on here, I'd guess you do. Hulu is something I really like because then I don't have to worry about catching up. Crackle isn't bad, either. Exactly my thoughts. These are things I"m trying to avoid as their my spending culprits. Especially not cooking at home. Ordering take-out is just as expensive as going out to eat. I guess it's all relative. 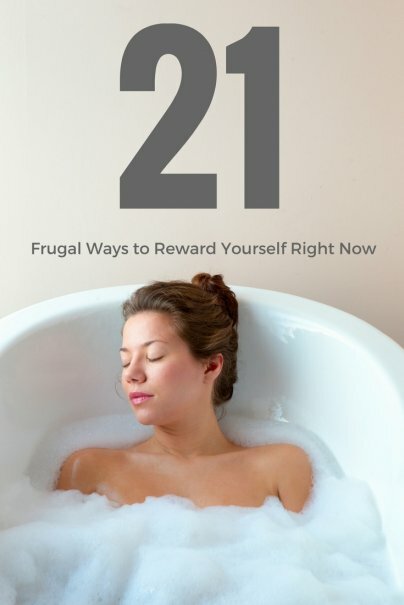 Some of these don't seem terribly frugal to me. Paying for an eyebrow wax or pedicure, having cable tv with a dvr, getting food delivered. These are all optional things we can't afford this week.